ARE YOU TIRED AND NERVOUS DUE TO DISTURBED SLEEP? SMILE STUDIO WILL SOLVE YOUR SNORING PROBLEMS IN ONE DAY! You can solve your snoring troubles and apnea (dangerous breathing disturbance that occurs during sleep) for good, by using Silensor. It’s a small and practical oral appliance that Smile Studio can make for you, based on the model of your jaw, in just one day. Assure a good night’s rest and health for both you and your partner! Sleeping causes relaxation of all muscles in the body, including the ones that maintain open respiratory pathways. With some people, especially if they sleep on their back, the soft palate lowers and the tongue falls towards the back wall of the larynx, thus significantly narrowing the size of the respiratory pathway. That is when the air starts flowing more rapidly through the narrowed area which causes vibration of the velum and its uvula, that in turn, produces a well known sound we call snoring. Why can snoring be considered dangerous? Besides producing noise on the level of noisy traffic, snoring by itself isn’t particularly dangerous. However, if the windpipe becomes completely closed for a moment, that leads to breathing termination called apnea. Every time we stop breathing during sleep, for a few seconds or minutes, the brain reacts by initiating the process of partial awakening by releasing the stress hormone. Apnea doesn’t occur with all people that have a snoring problem, but it can occur for years and up to 400 times a night, without us even becoming aware of it. Disturbed sleep leads to chronic fatigue which decreases our concentration and working capability and increases risks of developing depression. In addition to that, long-term exposure to stress hormones increases risks of high blood pressure, heart attack and stroke. This is why, even if your snoring doesn’t disturb your and your partners rest, it is important to prevent sleep apnea. How does the Silensor appliance work? 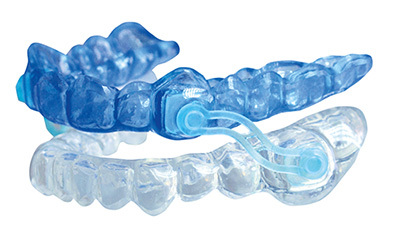 Silensor oral appliance holds the lower jaw in a correct position and it prevents backwards decline of the lower jaw and tongue, which keeps the respiratory pathway completely open. The appliance is individually adjusted to each patient which makes it very comfortable and 100% effective when it comes to solving snoring or apnea problems. How much does it cost to make a Silensor appliance? Making a Silensor appliance costs 2700 kn. The price includes taking a jaw impression, making the jaw model and the Silensor oral appliance itself. How long-lasting is Silensor? How is it maintained? Silensor is made of permanent non-metal material which is easy to maintain (brushing) and lasts for years. Smile Studio offers a 2 year warranty for your Silensor appliance. Who is the Silensor appliance meant for? Statistics show that, at the age of 30, 5% of women and 20% of men snore. At 60 years of age that percentage turns to 40% to 50% for both sexes! Also, it is interesting to note that a person spends 37% of their ‘sleeping’ time on her/his back, which is also a least beneficial position for snorers. Excessive body weight, smoking, allergies, sinus issues and alcohol and sedative consumption all increase snoring problems. Silensor is meant for everyone that with the problem since it has no meaningful disadvantage to its use. The only important thing to add is that Silensor can be used by partially toothless patients, but not by completely toothless ones. In that case, it is impossible to achieve an appropriate placing of the appliance on the jaw and therefore it can’t function properly. A crew of the HRT channel, TV show ‘ŽIVOT UŽIVO’ visited our dental clinic with the intention to research the snoring problem and its solution by using Silensor. In the episode we tried to show the process of making the Silensor appliance and its practical application. I found out about the Smile Studio several years ago through a friend and even though I live in northern Italy and have to drive 2.5 hrs to Croatia for my dental work, I can honestly say it’s worth the drive. Be informed about discounts, special offers and news from Smile Studio.